The first new model since Palm Beach Yachts was acquired by Grand Banks two years ago, the Palm Beach 42 is an elegant example of a modern Downeast boat with an aggressive low profile, long shear line and teak just about everywhere. 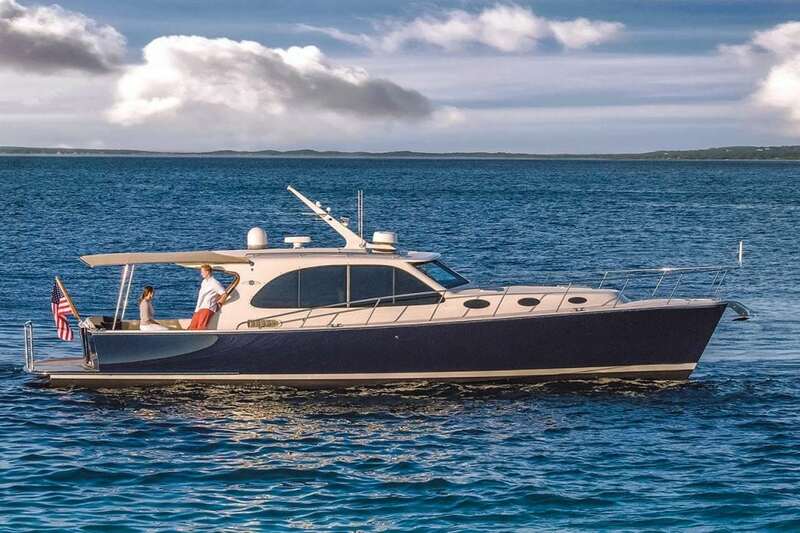 Built in Australia, the Palm Beach 42 also has luxuries—electric windows, Ultraleather upholstery, Silestone countertops—that never even entered the mind of a Maine lobsterman. “This is the most gorgeous and feature-rich yacht of its size out there,” says Mark Richards, the founder of Palm Beach and now CEO of parent company Grand Banks. With large integrated teak swim platform on the Palm Beach 42; the teak continues to the cockpit sole. The cockpit itself has a wet bar with Silestone countertop, and the salon offers two large facing settees. Owners have a choice of a single stateroom below and large galley down, or two staterooms below and galley up. The master offers a tapered island berth and a large head with shower. Richards, a world champion sailor, specializes in high-tech hulls.